The paleo diet is become increasingly popular in recent years and for good reason. It is a diet that emphasizes grass-fed meats and fresh vegetables, as it encourages you to eat the way humans did around 40,000 years ago. While on the paleo diet, there are a number of things you have to cut out, including grains, white potatoes, dairy, refined sugar and sugar substitutes, and legumes. While this diet may sound rather restrictive and strict, it actually has a lot of health benefits. For example, because you’ll be required to cut out refined sugar, you’ll also avoid those blood sugar spikes and afternoon crashes. 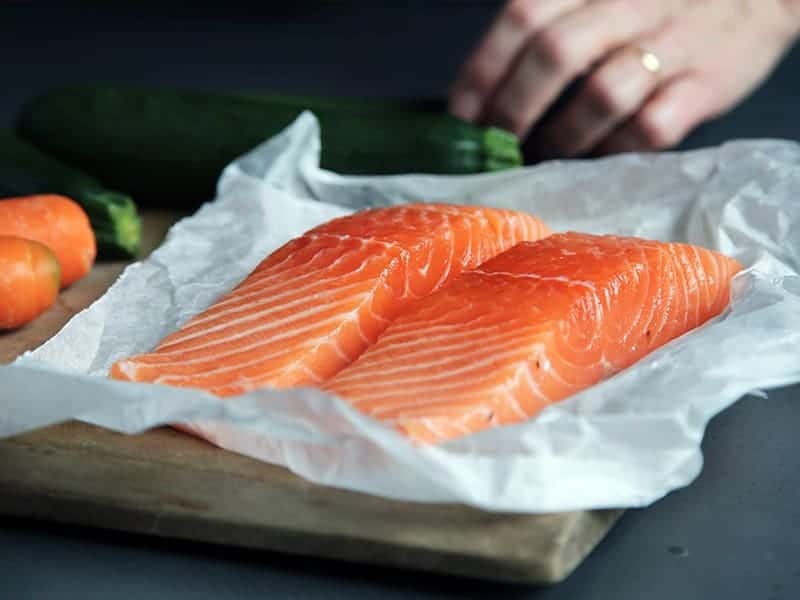 Also, many people switch to the paleo diet as a way to fight inflammation in the body, since the diet requires you to cut out so many foods that can exacerbate the problem (e.g. carbohydrates). If you’re interested in giving the paleo diet a go, you don’t have to be overwhelmed by trying to determine what you can and can’t eat. 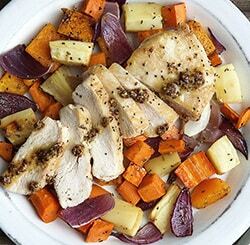 One of the easiest ways to get started is with a paleo meal delivery service. There are many specialty meal delivery services that provide high-quality paleo options to make it incredibly simple to stick to your diet. To help you out, below are a few of the best paleo meal delivery services you can try. How would you like to get your hands on paleo-friendly meals that are ready to eat in just two minutes or less? Well, that’s exactly what Factor 75 aims to provide for their customers. Instead of sending you ingredients and recipes, you’ll receive pre-made meals that are still fresh, flavorful, and healthy. When you’re feeling hungry, you simply have to heat them up and enjoy. It doesn’t get any easier than that! The best part is that you can feel good about eating any of the meals on their paleo plan. They feature grass-fed and pastured meats, organic produce, and low-glycemic carbohydrates. The meals are also 100% free of gluten and soy, never have antibiotics or hormones, and there’s no added sugar or artificial sweeteners. The “cherry on top” is everything is always free of GMOs. With Factor 75, you’ll receive meals that have larger portions of meat and vegetables, as well as increased fiber content. You’ll find dishes such as: the Grass-fed Burger with Tomato Bacon Chutney, Mustard Herb Pork Tenderloin, Steak with Sweet Potato Fries, Pork Carnitas, and the Chorizo and Kale Frittata. Pricing: The total cost of your Factor 75 order will depend on how many meals you receive each week. The cheapest option delivers four meals, which will cost $60. It comes to $15 per meal. Read our full Sun Basket review here. If you’d rather get into the kitchen and whip up meals yourself, you might want to check out Sun Basket. 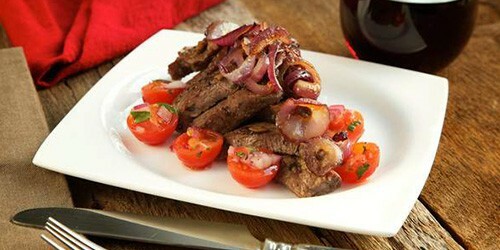 They offer multiple meal plans to suit a variety of dietary needs, including a very popular paleo plan. This plan is designed to provide you with clean recipes that are high in protein and filled with fresh veggies. You can expect to receive high-quality meats and seafood and no dairy, gluten, grains, soy, or corn. Each week, Sun Basket will allow you to pick from a few different recipes on their menu. Then, they’ll deliver the fresh ingredients and step-by-step recipes you need to create a delicious dinner yourself. With plenty of options to choose from, sticking to your paleo diet has never been easier. Pricing: If you’re looking to stick to Sun Basket’s Classic Menu, you’ll receive three recipes per week. There will be either two or four servings per recipe, allowing you to feed others or save some for tomorrow’s leftovers. With the Classic Menu, you can expect meals to cost $11.99 per serving. If you have a family to feed, the paleo meal plan is available for their Family Menu. This option gets you two, three, or four recipes per week, all of which will have four servings. The Family Menu costs $9.99 per serving. 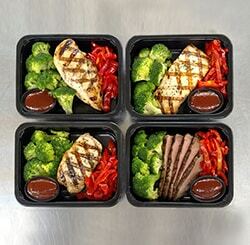 Another option for pre-made meals that you simply need to heat up is Trifecta. Their sugar-free and grain-free meals are packed with sustainable meats, as well as organic fruits and vegetables. Each meal delivers plenty of nutrients and will leave you feeling satisfied. Plus, you can always feel confident about the ingredients you’re getting since everything is non-GMO and high-quality. One great quality about the Trifecta meals is that most of the ingredients are locally sourced from the Central Valley in California, with the exception of certain regional items. You’ll even have the ability to choose meals for breakfast, which is something that many meal delivery services don’t offer. Their paleo menu includes a variety of breakfast dishes including: Rainbow Carrot Frittata, Sun-Dried Tomato Frittata, and the Hard Boiled Egg & Hash. For lunch and dinner, they offer dishes such as: Smoky Spanish Shrimp Fajita, Sesame Teriyaki Shrimp Bowl, Lavender Eggplant Turkey Bowl, Italian Mushroom & Chicken, and Curry Cauliflower Beef. Pricing: If you’re interested in the paleo plan from Trifecta, it starts at $149.90 per week if you’d like to receive two meals per day for five days. You can also opt to receive three or four meals per day, plus they have the option for a full week’s worth of meals as well. Read our full Trifecta review here. Something that stands out about Pete’s Paleo is how they manage their menu. While they change it up with new dishes each week, like most meal delivery services do, they also take into consideration the farmers they work with. They do this by incorporating what these farmers are harvesting each week into their meals, to ensure you’re getting the absolute freshest ingredients. Once they have the ingredients they need, the Pete’s Paleo chefs cook your meals fresh. Then they’re they delivered right to your doorstep. All you have to do is heat them up whenever you’re ready to eat. It’s quick and easy, but still flavorful and nutritious. While they are “heat and eat” style meals, they are definitely not like the pre-made meals you’re likely to find at your local grocery store. On their menu, you can expect to find a variety of dishes like: Adobo Chicken with Cilantro Cauliflower and Lime Zested Purple Potatoes, Roasted Garlic Tri-Tip with Golden Beets and Roasted Asparagus, Cajun Turkey Thighs with Okra and Roasted Butternut Squash, Marinara Chicken Meatballs with Spaghetti Squash and Roasted Brussels, and Balsamic Braised Short Rib with Swiss Chard and Roasted Fingerling Potatoes. Pricing: When placing an order with Pete’s Paleo, you’ll have the option of making a one-time purchase or signing up for a weekly subscription, which gives you a discount. Four five meals per week, you’re look at a subscription price of $115.62. You can also opt for 10 meals, 14 meals, or even their family plan. 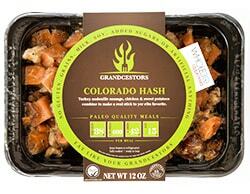 For quick and easy eats you can take with you, Paleo Meals To Go has you covered. What’s unique about their meals is that they come in pouches, which you simply add hot water to. After letting the water sit in the pouch with your freeze-dried meal for 10-12 minutes, it’ll be ready to enjoy! Of course, you do have the option to cook your meal on the stove, but this pouch preparation is incredibly easy when you’re on the go (like their name says). Unlike a lot of the other meal delivery services out there, Paleo Meals To Go also offers snack options, which are perfect for throwing in your bag when you’re heading for a day out. This makes it easy to stick to your paleo diet without ever going hungry or worrying you won’t have something to eat. You can browse their website to see what they have to offer, then add the items you want to your cart. There’s no commitment to a weekly service or anything like that. You’re in control of what you buy, how much you order, and how often you get new things. They have items such as: Bedrock Beef Chili, Canyon Chicken Chili, Caldera Chicken Curry, and Mountain Beef Stew. Pricing: The items range in price, but to give you an idea of their pricing the chili options cost $10.50, while the beef stew is $11.50. They even have a variety of fruit snacks that cost around $6.00. If you love to get into the kitchen, but would prefer someone else managed the hassle of meal planning and grocery shopping, Green Chef is another option to consider. They offer a paleo plan that’s filled with animal proteins and fresh produce. You won’t find any overly processed foods, grains, dried legumes, or dairy in their dishes. Each week, you’ll be able to select the meals you’d like to make and Green Chef will send the necessary ingredients and the recipes. On the menu, you will find: Coconut-Ginger Chicken, Shrimp Scampi, Steak Frites, Sage Pesto Baked Cod, Dukkah-Spiced Steak, Cumin Pork Chops, Basil Pesto Chicken, Almond-Crusted Salmon, and Chicken Pumpkin Stew. Green Chef has a ton of different options, so you’re sure to find something you’ll like. Pricing: You can opt for a two-person plan or a family plan when ordering Green Chef’s paleo plan. It’s priced at $14.99 per meal. 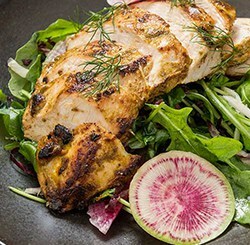 Chef’d is a meal delivery service that is known for their collaborations with organizations like the American Diabetes Association and Atkins. But for those who are committed to a paleo lifestyle, they also offer some meal options that have been curated by Paleo Magazine (the biggest paleo magazine around). The dishes they’ve submitted to Chef’d include a Butternut Squash Soup, Quick Burgundy Beef, and Skillet Chicken. Each of these items can be purchased a la carte so you’re not forced into a subscription plan. Plus, you can opt for servings for two people or four people. Chef’d will then deliver what you need to prepare your meal so you can have a delicious dinner in no time at all. Pricing: For just two servings, you’re looking at a price range of $26 to $35, based on which meal you choose to order. If you need four servings, you can expect to pay between $42 and $59. Read our full Chef’d review here. 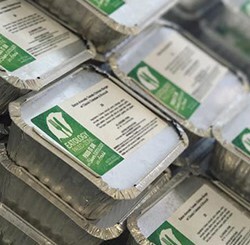 Another service that provides pre-made meals that simply require reheating is Pre-Made Paleo. Their meals are created and prepared by a team of paleo chefs and then delivered to your doorstep. All you have to do is follow the reheating instructions included with each meal. They have a lot of offerings on their website, including options for breakfast, lunch, and dinner. 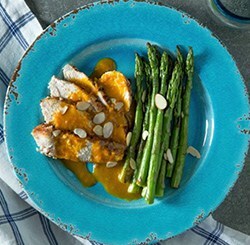 Pre-Made Paleo even provides their customers with Whole30 approved options, as well as meals that follow autoimmune protocol for those with an autoimmune disease. Their menu includes dishes such as: BBQ Beef Burger with Organic Cabbage Slaw, Jerk Pork served with Butternut Squash and Mushrooms, Kale Pesto Chicken Breast served with Cabbage Slaw/Butternut, Lemon Chicken with Cauliflower, Butternut, and Greens, and a Turkey Meatloaf with Mushrooms served with Root Vegetable Mash. 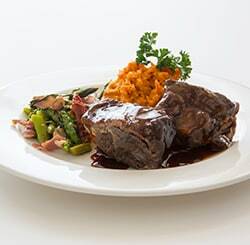 Pricing: Individual items on their a la carte menu range start at $9.99 and go up to $17.50. They also have a variety of subscriptions you can sign up for, which starts at $72. Devoted to bringing quality, delicious food to their customers, CavemanChefs caters to a variety of dietary needs. Whether you’re following a paleo diet or doing the Whole30, eating gluten-free, or need autoimmune-friendly foods, they’ve got you covered. They offer 100% grass-fed beef and lamb. The chicken and pork they use is antibiotic and hormone free. They get wild caught Alaskan and verlasso salmon for their dishes. And they source local, organic, and seasonal vegetables. This means you can always feel great about the quality of ingredients you’re receiving in each CavemanChefs order. Everything is then prepared and sent to you, along with reheating instructions. On the menu, some of the dishes you’ll see include: Lamb Sirloin with Artichoke Olive Tapenade and Radicchio, Basil Chicken with Snow Peas, Carrots, Onions, and Coconut Cream Broth, and Shepherd’s Pie with Seasoned Wagyu Beef, Carrots, Onions, Celery, Deiced Sweet Potato in a Rich Tomato Gravy. 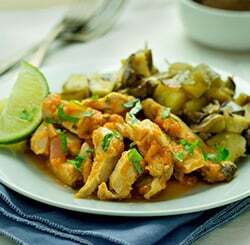 Pricing: The most affordable option with CavemanChefs is the medium plan with six meals/four weeks. 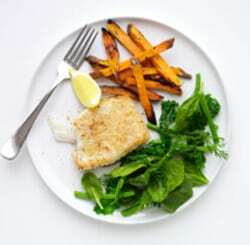 You’ll receive a total of 24 meals, which average about 550 calories per meal. This plan will cost you $330. What happens when you combine a culinary trained chef and a crossfit trainer? You get Paleo Power Meals. 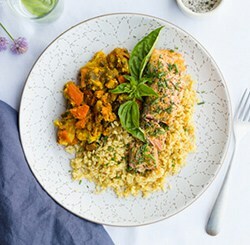 If you’re trying to eat healthier and get in better shape, you’ll want to take a look at their meal delivery service. They’ve taken the guesswork out of meal planning by choosing the dishes and sending everything straight to you. For dinner, you can dine on BBQ Pulled Chicken All-Natural Pork Short Ribs, Beef Stew, a Grass-Fed Burger, Herb Crusted Salmon, or even Spaghetti and Chicken Meatballs. Their lunch options include a Chicken and Avocado Caesar Salad, Chicken Florentine, and Free Range Chicken Fingers. And you can’t forget the Bacon and Egg Muffin, Sweet Potato Hash Browns, or the Breakfast Burrito-Less Scramble for breakfast! Pricing: You can buy items in bulk or choose to snag individual meals. Breakfast items start at $5.95, lunch starts at $8.95, and dinner starts at $10.95. Fresh ingredients that have been grown without harmful chemicals is a large part of following the paleo diet. That’s exactly why Paleo Diet Delivered is committed to sourcing quality ingredients for their meals. With the best ingredients in hand, their gourmet chefs prepare your meals fresh. Once they’re all done, they’re shipped off to your home for you to enjoy. The most work you’ll have to do is heating up your meal whenever you feel hunger coming on. It’s the ideal option for anyone with a busy lifestyle who doesn’t have time to be in the kitchen or someone who simply doesn’t enjoy cooking. The good news is, you don’t have to worry about these pre-made meals being bland or boring. Paleo Diet Delivered actually has a lot of options for you to select from. They have Paleo BBQ Salmon with Broccoli and Red Pepper, Paleo Turkey and Bacon Burger with Sweet Potato Wedges and Paleo Ketchup, Paleo Vegetarian Chili, Paleo Thai Sweet Chili Tilapia with Mixed Asian Vegetables, and Paleo Chipotle Beef with Grilled Vegetables. Pricing: Poultry, beef, pork, fish, chili, and burgers are all priced at $16.95 per item. They also offer juices you can get for $12.95. How would you like a healthy dish that feels like you’re eating one of your “cheat meals”? That’s exactly what Eatology aims to provide with their meal delivery service. After all, eating healthy doesn’t have to be flavorless. You can still eat plenty of amazing dishes even when you’re trying to be smart about your food choices. And with breakfast, lunch, and dinner options, you never have to worry about going hungry! For breakfast, you’ll be able to order things like the Avocado Chicken Breakfast Scramble with Sautéed Spinach, Pastelon Pie Breakfast, and even some Pumpkin Gingerbread. For lunch and dinner, you’ll be able to enjoy things like Spicy Sriracha Chicken with Spanish Rice & Fajita Veggies, Classic Chili Bowl with Mixed Veggies, Mushroom n’ Gravy Meatballs with Paleo Rice & Green Beans, and Aloha Turkey Burgers with Carrot Fries & Islander Stew. Pricing: You’re able to order once or sign-up for a subscription with Eatology. For single orders for the week, you can get 10 meals, 15 meals, or 21 meals. For 10 meals per week, costs start at $105. Read our full review of Eatology here. Pricing: Each meal costs $9.99, which is an absolute bargain for what you’re getting compared to some of the other, more expensive paleo meal delivery services on this list. Read our full review of Terra’s Kitchen here. 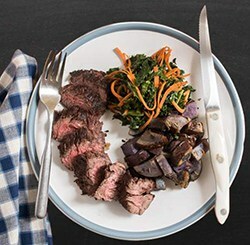 Another meal delivery service that offers options suitable for those following the paleo diet is Terra’s Kitchen. They’ve designed meals that are focused on lean proteins, fresh fruits and vegetables, as well as flavorful herbs and spices. Besides just offering dinner options, they also have meals you can get for breakfast and lunch. There are even snacks, beverages, and other desserts you can enjoy. 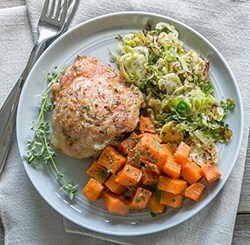 Some of the paleo-friendly meals you can try include: Seared Cod with Fennel and Orange Salad, Spice-Rubbed Steak and Vegetable Sauté Bowls, Black and Blue Steak Salad, and Garlic Mushroom Smothered Chicken. Pricing: The prices from two serving meals range from $10.99 and up. This all depends on the ingredients included in the dish you’re purchasing. What does a typical day of Sunfare food look like? You could be dining on a Country Breakfast with Root Vegetables in the morning, a Tuna Nicoise for lunchtime, and then a Grilled Lemon Garlic Chicken at dinner. If root vegetables aren’t your thing, your breakfast might include Banana Flax Seed Pancakes, a Turkey Breast Scramble, or even Salsa Verde Chicken. For lunch, they have Moroccan Shrimp Salad, Cajun Chicken Stuffed Yams, and Summer Salmon Salad. 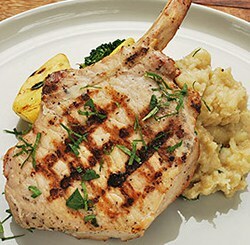 Dinnertime could have you eating Pork Ribs, Chicken and Mushrooms, Turkey Bolognese, or even a Sizzling Skirt Steak. Pricing: You can opt for a weekly or monthly plan. If you choose the monthly plan, the 20-day plan will cost $999, which comes to a daily cost of $49.95. The 28-day plan is $1,398.60. Alternatively, you can go the a la carte route and choose meals weekly. 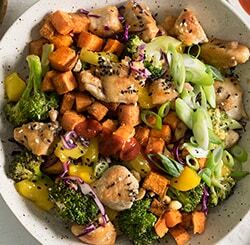 MealPro’s paleo plan includes plenty of white fish, low-sodium meat, and high-fiber vegetables. When browsing their menu, you’ll find things like Chicken and Sweet Potatoes, steaks, cod, salmon, and so much more. To place your order, you just need to select your plan and then choose the meals you want to receive. They offer a six meal bundle and a 10 meal bundle. And don’t worry, the six meal bundle allows you to purchase without the commitment of a subscription. Pricing: The cost of their meals ranges from $8.99 to $11.99. Fresh meals, natural ingredients, and free delivery? What could be better than that? That’s exactly what Ionutrition delivers to their customers! If you’re looking for an easy way to stick to your paleo diet, their nutrient-dense meals are just what you’re looking for. Made with 100% natural and organic ingredients, you don’t have to feel bad about eating these pre-made meals. Each meal is delivered fresh to your doorstep and is never frozen. This means you can count on having high-quality, savory meals for you to enjoy throughout the week. Their meals never have preservatives, additives, dairy, gluten, GMOs, hormones, added sugar, or soy. On their paleo menu, you’ll find breakfast items such as: a Kalamata Spinach Frittata, a Paleo Breakfast Loaf, and Hard Boiled & Hash. For lunch, you get to enjoy Smoked Cauliflower & Spinach, Italian Rainbow Veggies & Shrimp, and a Basil Mushroom Salmon Bowl. Dinner options include Southwest Vegetables & Beef, Roasted Squash & Beef Patty, and Squash “Bolognese” & Beef. Pricing: You can choose between ordering from their a la carte menu or signing up for a meal plan. The meal plan delivers food to your house on a weekly basis, which costs $12.99 per meal for their paleo plan. One of the things that stands out about Kettle Bell Kitchen is that their team crafts a custom nutrition plan for your specific needs. Once you share your health goals with them, they’ll create a plan that works for you. From there, you have to approve the plan and sign-up to receive your weekly meals. You’ll then be on your way to receiving delicious dishes like Turkey Meatballs with Tahini, Beef Stroganoff with Zucchini Noodles, Mango Shrimp and Chicken, and Turkey Breast with Homemade Cranberry. Pricing: You can order individual dishes through their a la carte menu. Most of these costs $11.95.